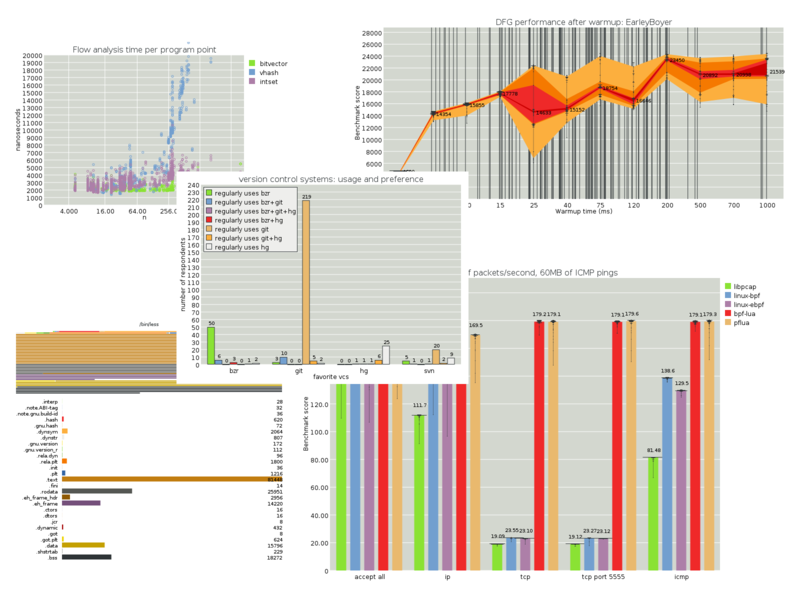 Guile-Charting is a library to create charts and graphs in Guile. It is thus far a hack, but there are interesting things in it. The latest release can be found from Guile-Charting's release area. If you want to hack Guile-Charting, you can pull the code from the git repository via git clone https://gitorious.org/guile-charting/guile-charting.git. You will need to have installed Guile-Cairo for things to work. Guile-Charting is self-documented, check the reference in HTML format or PDF, online in Guile itself, or use info guile-charting once you install the package. I don't plan on being a responsive maintainer on this, but if you are struck with a brain wave, accompanied with a patch, send it to wingo at pobox.com.